Juri is the only woman in a position of true institutional power in Revolutionary Girl Utena. By all appearances, she has everything: she’s beautiful, treasurer of the powerful Student Council, captain of the fencing team, and she has the respect and adoration of not only the student body, but the faculty and administration as well. And yet, rage seethes and simmers just under her placid surface. Oh, she hides it well, most of the time. When Utena says, “They say that you’re trouble, and those who know your hidden face wouldn’t get within 10 meters of you,” she laughs it off, responding, “Heh, makes me sound like a wild animal.” But it is this rage that forces her to become an unwitting tool of the patriarchal system of dueling to possess the Rose Bride. There is no doubt that Juri rose to her position of power through her own competency. She displays great skill at every turn, after all. But even that is called into question early in her episode, when the vice principal offers to “discuss the student council’s plans over lunch”. Sure, his intent could be purely professional, but this is Revolutionary Girl Utena, where an adult man’s interest in a teenage girl is almost never well-intentioned. His invitation is completely inappropriate, but exemplary of how attractive powerful women are frequently objectified and treated in ways determined by their looks, rather than their abilities. Juri masks her anger most of the time with a veneer of aloofness, claiming not to believe in the power of miracles. Even as Touga and Miki discuss her at their meeting, she lies back on a chaise lounge, responding only with dry remarks. She claims that she only wants to possess the Rose Bride to disprove her power, that she is just another teenage girl. 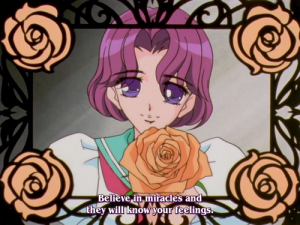 She jokes that it would be useful when taking exams, a line she took directly from a conversation with Utena herself. These “miracles” that Juri fights against are any unfair favors that a person may receive due to what they are, rather than who they are. Yes, Juri is hyper-competent and ambitious, but as her conversation with the vice-principal indicates, some of her advantages may have been earned by her looks, rather than her achievements. It’s a question that appears whenever an attractive woman achieves a high rank, recognition, or even is hired for a job where she is visible to the public: was she truly the most qualified candidate? She doesn’t even have to sleep her way to the top, she just exist within the standards of traditional beauty. And then comes Utena. 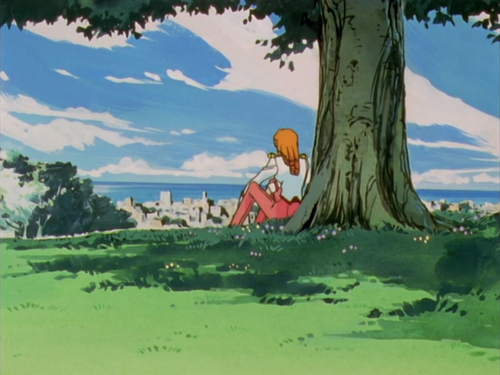 Utena, who is so much like a young Juri: beautiful, adored, and good at most everything. 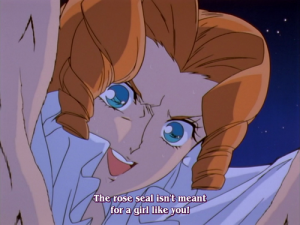 Utena, who wears the Rose Seal without an appointment to the Student Council. Utena, who won the Rose Bride and her powers without even understanding the rules of their dueling game. Utena, received her ring from a mysterious man, and hopes someday to meet him again. “A girl like you.” Juri’s rage and disappointment in Utena, and in the whole system, is poured into these words. The friendliness with which she had spoken to Utena disappears in an instant, only to be replaced by hatred. Her face twisted with anger, her locket sparkling, Juri challenges Utena to a duel to forcibly remove her naiveté. 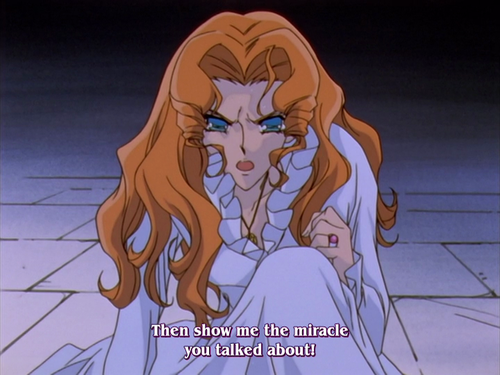 Utena reminded Juri of herself a few years ago, the reason why she lashes out with such anger. Juri is never seen interacting with another female character in a friendly manner outside of flashback. As the only woman in a position of power, who was hurt long ago by her sole female friend, she’s grown convinced that she’s not like other girls. She saw a potential ally in Utena, another girl worthy of leading the students of Ohtori Academy. To find out she received her ring from a boy, and only duels in hopes of meeting him, is a betrayal of the highest order. Before the duel, Juri tells Utena, “If you win using a miracle, you deserve your conceit.” But where has Utena displayed conceit? Utena is probably one of the most humble characters in the entire show. This conceit is, rather, her belief in her prince and thus in the power of miracles. It is the belief that she is special and loved in a way unique to her, allowing her to participate in the duels. It is that she came to possess the Rose Bride, not through her own doing, but through some unique power. To believe in miracles is conceit. In their duel, Juri attacks Utena ruthlessly. Her skill is obviously much greater – after all, she’s captain of the fencing team. She taunts Utena as they fight: “Poor girl. You’re already exhausted. But I absolutely won’t let up on you.” As she says this, her memory flashes back to the girl she once was, and the words of her friend Shiori who betrayed her, stealing away the boy she thought Juri loved. “Believe in the power of miracles, and they will know your heart,” she said. This was the girl who destroyed Juri’s innocence, who robbed her of the belief that she could be special and loved for it. In the same way, Juri wants to destroy Utena’s innocence. And so, she disarms Utena. As she throws her down, preparing to slice the flower from her breast, Utena’s sword falls, impaling Juri’s flower and slicing it from her chest. “No…that was just an accident! No miracle was involved!” Juri protests, but the fight is over. Utena, whether by accident or through the power of miracles, retains possession of Anthy. Juri’s vicious attacks against Utena, both in and out of the dueling arena, are representative of one of the most insidious elements of the patriarchy: internalized misogyny. She hates Utena not for who she is, but what she is: a young girl who is willing to admit to something as silly and girlish as competing in a high-stakes competition in hopes of finding a boy. In denying the power of miracles, she holds claim to the belief that she achieved her status entirely through her own merits, denying that anyone else is held back by their gender (or race, or orientation, or identity).